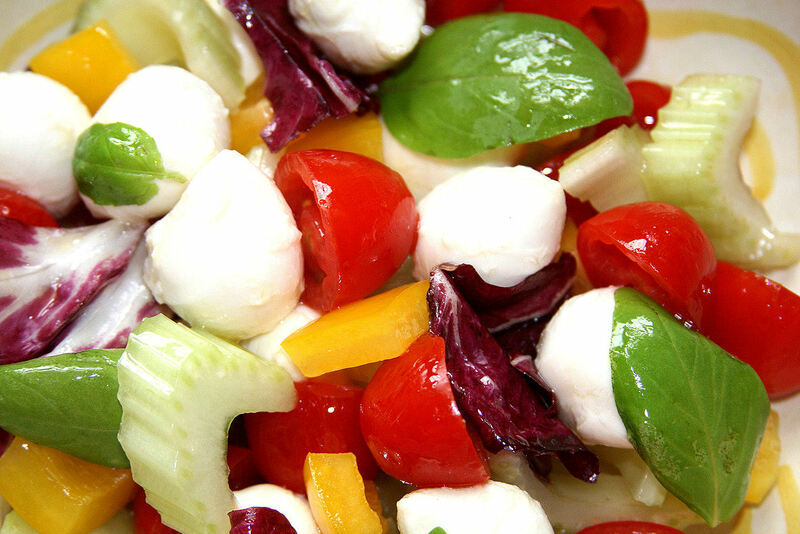 Duirng warm weather, Mozzarella Bocconcini Salad is very popular in Bologna. Combine creamy mozzarella with crunchy vegetables and basil. Serve as a first course or main dish. Chopped salad isn't for lunch at your desk any more. Have a summer party! 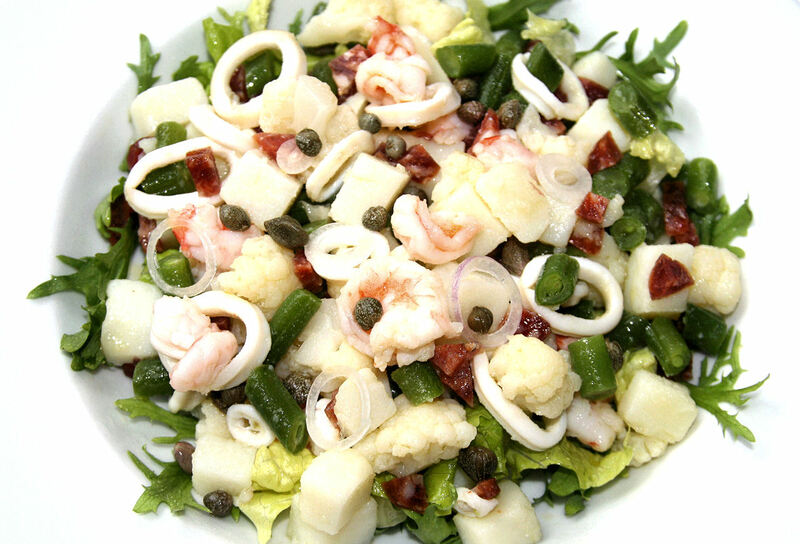 Add poached seafood, roast chicken, or spicy salame, for your signature Chopped Salad. We're having a heat wave…and zucchini are at their peak. 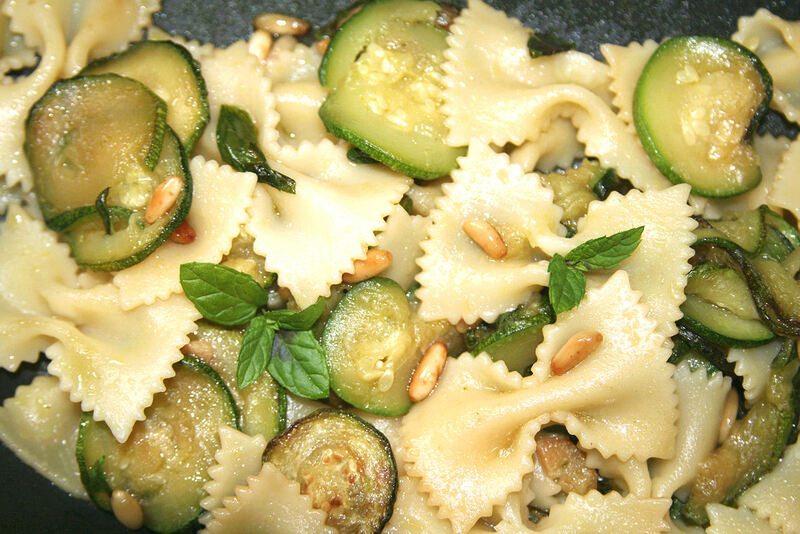 Quick cook Farfalle with Zucchini, Mint, and Pine Nuts. It's light and cooling, perfect for hot, humid days. 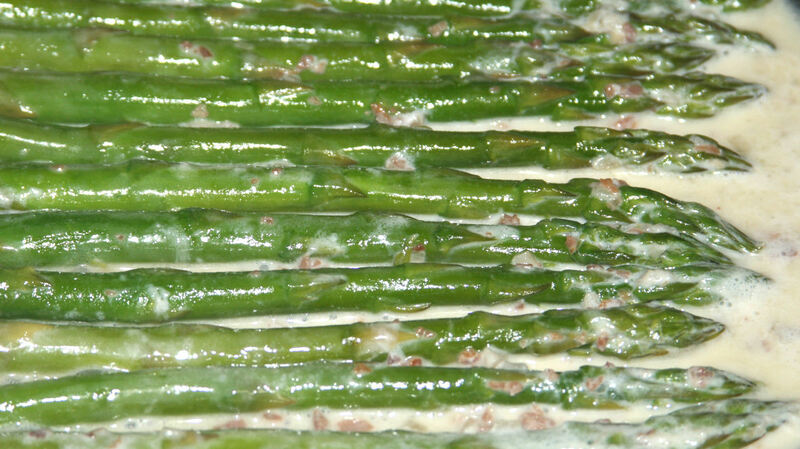 Make delicious Asparagus Parmesan, Cooked in a Pan, with Prosciutto Cream Sauce. Professional chef techniques. All you need is 1 pan, 10 minutes. Perk up summer grills with Italian Spiedini or Sicilian Skewers of Grilled Sausage, Orange, Onion, and Bread. Red Radicchio Trevisano with Oranges shines when kept simple. Five ingredients. That is all you need for this winter salad. Crunchy, sweet, tart, peppery. Sauced in broth, Tagliatelle with Asparagus, Prosciutto Crudo, and Shrimp becomes light and savory while remaining low in calories. Substitute salmon or mussels for the shrimp. During late Spring and early Summer in Italy, we enjoy Farro Salad with Fresh Peas, Scallions, and Fresh Mint as an antipasto or side dish with grilled main dishes. Easy and cooling. Portafoglio means wallet or billfold, and opens like one. Butterfly chicken breast, stuff it with ham, cheese, and asparagus. Bake until succulent. For Italian chefs and Italian massaie or farmers' wives, a favorite way of braising meat is using a cartoccio. Beef Brisket, Braised with Paper Cartoccio, becomes fork-tender and juicy. Chocolate Polenta Honey Cake is an exceptional Italian torta sure to become a family favorite. Moist and tender, sprinkle with powdered sugar, accent with whipped cream and berries. Classic Baked Eggplant and Tomatoes is a favorite Italian offering in trattorias. Serve as antipasto, or as a side dish to grilled seafood, meat, or poultry. Roasted Grapes with Garlic and Rosemary transforms an ordinary "snack fruit" into an intriguing side dish for roasted and grilled main dishes.